Traditional wood-burning fireplaces perpetuate messiness. Between the lost bark from logs and paper scraps or the used matches required to light the pilot/kindling your living room could look like a disaster area before you know. Then of course there’s the hassle of having to pick up and haul the logs inside from the cold. 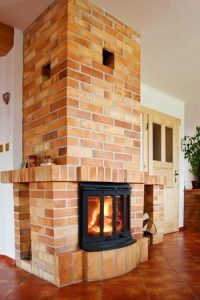 Traditional wood-burning fireplaces also need regular maintenance. If you don’t have a professional cleaning conducted on your fireplace at least once a year, the soot buildup presents a serious fire hazard. The heat from your regular fires could actually ignite the creosote buildup and any debris that collects from regular wood burning. This is the cause of around 25,000 annual chimney fires. Luckily you have the option to take the hassle and maintenance cost out of starting a fire to the coziness level in your home up a notch. Gas inserts create the same warm, homey effect as a traditional, wood-burning stove, but can be turned on and off without tracking any messy logs through your living room. What’s more is gas inserts are actually safer for your home and family. Without having to regularly clean your chimney, you remove the element of risk associated with chimney fires. What’s more, you don’t have to worry about the annual cost of maintaining a wood-burning fireplace. Inserts are also insurmountably more efficient, projecting the entirety of its heat production into your home. This compares to traditional fireplaces, whereby 90% of heat produces is lost right up the chimney. Traditional wood-burning fireplaces are messy and pose more than a few hazards. Aside from the increased fire hazard, suppose you had to go outside in the dead of winter to get firewood; you’re exposed to the risk of slipping on ice. Not to mention it is just plain uncomfortable. Gas inserts, on the other hand, are clean, efficient and can be ignited with the flip of a switch without having to go outside to face the elements for any reason.